For polishing, wire brushing, and metal removal on dies, stampings, gear teeth, plastics, tubes, castings and weldments. Uses standard rotary files, standard or carbide wheels, wire brushes, mounted points, and sanding drums. Our patented metering trigger lets operator control speed from 0 to 25,000 rpm. Motor retainer nut can be taken up as the tool wears to eliminate play. Air exhausts away from polishing wheel so chips don't blow back at operator. Furnished with two collets-a 1/4" machined on the shaft for minimum "run-out", and a 1/8" collet that slips into 1/4" collet body. Weight - 15 oz. | Air Consump. at 90 psi - 6 C.F.M. Compact and lightweight one-piece aluminum die-cast housing provides the versatility and maneuverability needed to work in small, restricted areas. Integral rear exhaust design reduces material blow-back. 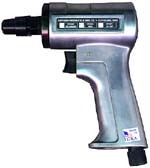 Convenient lever throttle for one-handed operation automatically shuts unit off when released. Great for polishing, wire brushing, and metal removal on dies, stampings, gear teeth, plastics, tubes, castings and weldments. 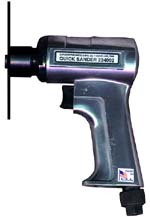 Uses standard rotary files, standard or carbide wheels, wire brushes, mounted points, and sanding drums. Oper. Pressure 90-100 | Air Consump. at 90 psi - 4 C.F.M. Air Inlet - 1/4 NPT | Min. Hose 3/8"
Compact and lightweight one-piece aluminum die-cast housing provides the versatility and maneuverability needed to work in small, restricted areas. Integral rear exhaust design reduces material blow-back. Convenient trigger throttle for one-handed operation automatically shuts unit off when released. Great for polishing, wire brushing, and metal removal on dies, stampings, gear teeth, plastics, tubes, castings and weldments. Uses standard rotary files, standard or carbide wheels, wire brushes, mounted points, and sanding drums. 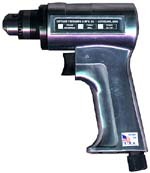 A lightweight 3/8" capacity industrial drill that develops 1/3 horse power at 90 PSI. 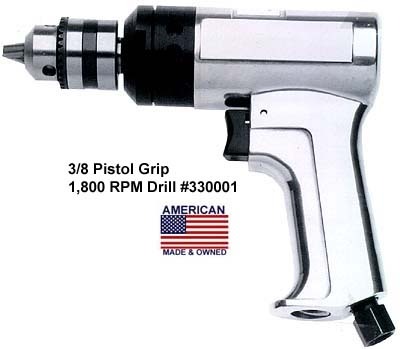 The drill has a precision gear reduction assembly with precision bearings. 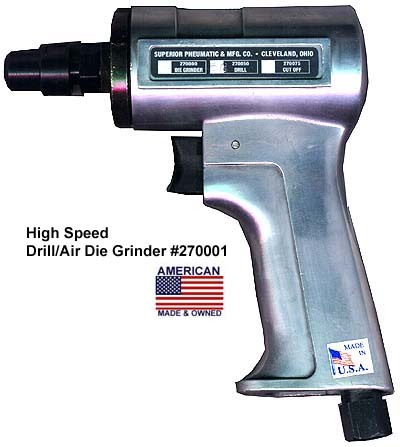 The drill speed is 1800 rpm and has an exhaust deflector that rotates to direct air exhaust in desired direction. 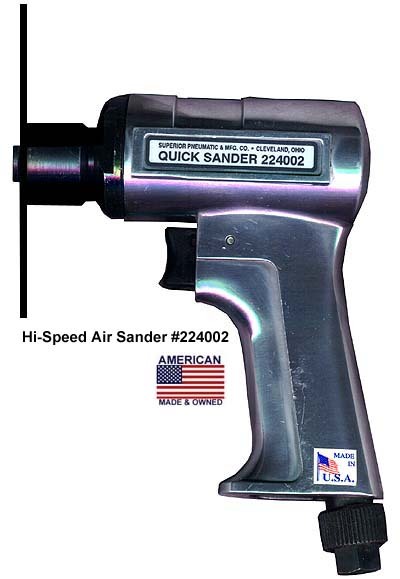 Weight 2 lb 8 oz.| Length 7 1/4"
Weight 1 lb 2 oz.| Length 6"
Ideal for close-quarter body work and light feather-edge sanding. Lightweight all-aluminum handle. Heavy duty four-vane motor. Precision bearings. No fatigue - one hand pistol grip operation with metering trigger. Air Inlet - 1/4 NPT | Min. Hose 3/8" | Spindle 7/16 X 20"
Weight 2 lb 4 oz.| Length 5 1/2"
Hand held Air Cut-Off and Grinder that provides low cost, high production cutting on a wide range of materials, such as cutting tubing, small rod, sheet metal, fiberglass, Formica¨ and wood. Many of the jobs usually done manually by hacksaw can now be completed quickly and effortlessly with this tool used as a cut-off. The tools may also be used as a grinder by installing a 1/4" wide grinding wheel. Wheel guard adjusts a full 360 degrees and locks in position. 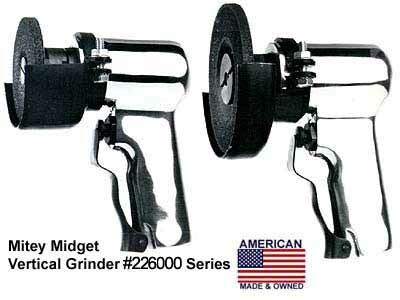 The Mitey Midget Vertical Grinder is a lightweight, heavy duty production grinder. It develops 1/3 HP at 90 psi, direct drive and two precision ball bearings assuring trouble-free performance. The metering trigger allows the operator complete wheel control and ease of operation. They are available to accept either 3" or 4" (type 27) depressed center grinder wheels. 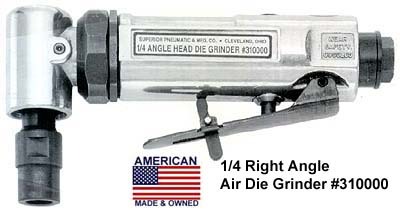 Air Inlet - 1/4 NPT | Hose 3/8 or 1/4"
Weight 2 1/2 lb (less guard) | Height 6 1/2" with 3/8" guard, 7" with 5/8"
The vertical grinder and sander is a powerful, smooth-running and easy to handle tool. It comes equipped with guards that meet OSHA Standards and develops approx. 3.5 HP under load. Precision ball bearings support all rotating parts. Available in three speeds: 4500, 6000, and 8000 rpm. Muffler quiets tool to a whisper. Air Inlet - 1/2 NPT | Hose 1/2"
Weight 8lbs. 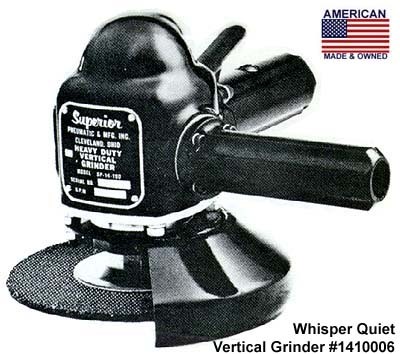 | Height 5 1/2"
4500 RPM | cup wheel 6" | sanding pad 9" | dep. center wheel 9"| cup wire brush 9"
6000 RPM | cup wheel 6" | sanding pad 7" | dep. center wheel 9"| cup wire brush 6"
8000 RPM | cup wheel 4" | sanding pad 5"
Powerful, smooth-running, and easy to use with rugged construction for year's of trouble-free service. The liner and plates are hard chrome plated for extra life. Four precision ball bearings support the shaft and rotor. Muffler quiets tool to a whisper. Weight 9lbs. | Length 22"
4500 RPM | Bonded wheel 6"
6000 RPM | Bonded wheel 6"
9000 RPM | Bonded wheel 4"